what do you think this will return? I have a question for you on DB development blunders! Last week Kalen Delaney wrote Did You Know? I have a question for you on DBA Blunders! I though the comments were very interesting, S we did the DBA part but what about developers? What are some of the worst blunders you have seen? Starting a begin tran, then some insert/update command, never commiting but minimizing the window. Here is my all time favorite, can you reduce this by 90%? What about changing the datatype from smallint to int in the table but keeping the params smallint in the proc.....mmmm why do I get a conversion in the execution plan? 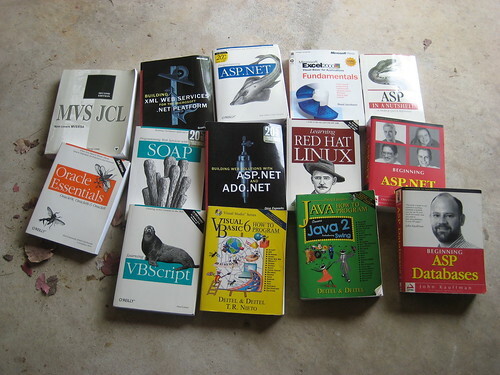 I did some spring cleaning yesterday, I got rid of some old or obsolete books. I asked some people at work if they want any of these books and I believe all the books except for the JCL book are about to be given away. Click on the image and you can see a bigger version on my flickr page. Mladen Prajdić just released SSMS Tools PACK 1.0. SSMS Tools PACK is an Add-In (Add-On) for Microsoft SQL Server Management Studio and Microsoft SQL Server Management Studio Express. Run one script on multiple databases. Copy execution plan bitmaps to clipboard. Search Results in Grid Mode and Execution Plans. Generate Insert statements for a single table, the whole database or current resultsets in grids. Query Execution History (Soft Source Control). Text document Regions and Debug sections. Running custom scripts from Object explorer's Context menu. CRUD (Create, Read, Update, Delete) stored procedure generation. Without running this what do you think will be printed? What Would You Like To Ask Erland Sommarskog? In the Who do you want to see interviewed next? (sqlblog) and Who do you want to see interviewed next? (here) blog post I asked for some names of people who YOU would like to see interviewed. Erland Sommarskog's name was submitted in comments a couple of times. I contacted Erland and am happy to anounce that he has agreed to do this. Before you think of any questions please visit Erland's page first (http://www.sommarskog.se/index.html) and read some of the articles he wrote. You can submit questions until Monday May 12th and then I will forward the questions to Erland. What Would You Like To Ask Craig Freedman? In the Who do you want to see interviewed next? (sqlblog) and Who do you want to see interviewed next? (here) blog post I asked for some names of people who YOU would like to see interviewed. Craig Freedman's name was submitted in comments a couple of times. I contacted Craig and am happy to anounce that he has agreed to do this. Before you think of any questions please visit Craig's blog first(http://blogs.msdn.com/craigfr/) to get a feel of what kind of questions to ask. It would make sense to keep the questions focused on query processing, query execution, and query plans. I told Craig that if he doesn't like a question that he does not have to answer it. HTML Source EditorWord wrap I answered this question on the MSDN forums: How can I search all my sprocs to see if any use a function? result: Object does not reference any object, and no objects reference it. 3.2 Example 1: Testing for SQL Injection in a GET request. 3.3 Example 2: Testing for SQL Injection in a GET request (2). Who do you want to see interviewed next? Who else should I interview? I have some ideas but I would like you to participate. Here is my thinking, after we have a list of possible people, I will contact them and ask if they will agree to an interview. If they agree I will make a post here and ask you what you would like to ask this person. I usually have a good set of questions but there might be someone out there with some real good/interesting questions. So post the name of the person you would like to see interviewed and hopefully this person will agree. Please keep it database related, it doesn't have to be specific to SQL Server but it has to be applicable to SQL Server.